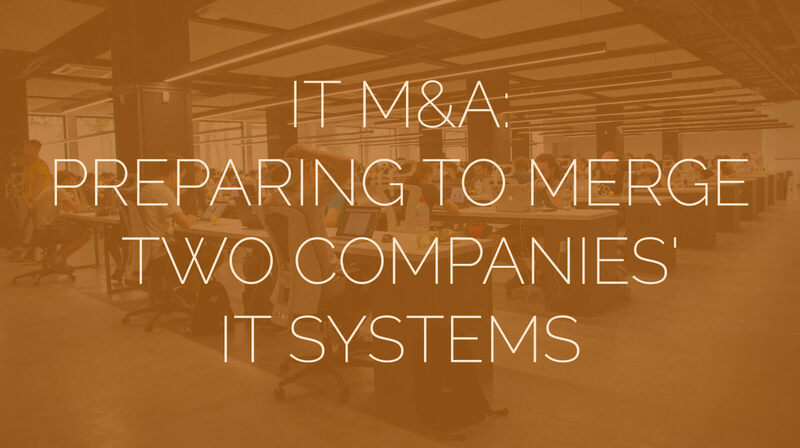 For a successful merger, IT needs to be full partners in the IT M&A process. Mergers and acquisitions are a regular part of business growth, especially among larger companies. And yet, even as these deals continue to move forward at a rapid pace, many companies haven’t stopped to re-examine their procedure in light of technological progress. But as businesses grow increasingly reliant on technological applications for their day-to-day operations, it grows increasingly untenable to conduct the M&A process without consulting IT. IT departments tend to be full of problem solvers. But when a company over-relies on their ability to “figure it out,” it can lead to sub-optimal outcomes. The IT department may do their best to devise a workable solution, only for the CEO to complain that it doesn’t match their ideal. Prepare for an IT M&A merger from the moment you start looking for a target acquisition. If you know you’re planning to acquire a new company, there’s no sense in waiting until you’ve selected the acquisition to start planning the inevitable IT merger. Depending on the complexity of your IT systems, it may take a significant amount of resources to prepare the systems to merge. Advance warning gives your IT team the time they need to assess the current state of their affairs and flag anything that might be problematic. Early planning with the IT team can also help a company better select their target acquisition. The CIO can discuss the integration process, highlight potential difficulties, and give the acquisition team guidelines on what to look for in the target company. This can help narrow the search for new acquisitions, and help companies avoid potentially incompatible deals. The target company’s IT assets must be considered during the due diligence process. Once an organization homes in on their acquisition, the IT team should be ready to start working in earnest. Just as companies conduct due diligence into a business’s financial stability, business practices, and organizational culture before a merger, the IT team should also engage in due diligence by examining IT documentation and interviewing key personnel. For instance, if the two companies use completely different operating systems, have varying security protocols, or have radically divergent practices for documenting their work. The cost of integrating these systems—many of which are critical for functional business performance—may incur more risk than the parent company is willing to take on. However, they will only learn this if they involve their IT teams early in the due diligence process. Who are the core IT personnel in the acquisition company, and can you retain them? Mergers aren’t just about technology or business assets—they’re also about the people who made them happen. A company merger can be unsettling to many employees, especially as they often involve a consolidation of staff resulting in lay-offs or contract renegotiations. In the shuffle it’s possible that some critical staff may leave the company, taking with them critical knowledge of how IT systems are organized and operated. An effective merger prevents this by identifying up-front the key players who are most able to aid in the IT M&A process. A review of staff should be part of the IT due diligence process, so that organizations can ensure they offer critical team members the kind of employment package that will encourage them to sign on with the new company. How are your companies planning to merge? Not every company merges in the same way. Sometimes one company completely absorbs the other, while at other times they leave them relatively untouched and independent. In the most complicated scenario, the companies decide to try to synthesize something entirely new by keeping the best parts of each business, possibly even creating a new brand in the process. While each of these decisions may have strategic advantages, they have extraordinary consequences on your IT systems. If the parent company plans to leave the acquisition company largely untouched, then IT may have little to do. On the other hand, if the new company is to be absorbed into the acquiring one, then it will mean a complete overhaul of their existing systems. Most disruptive of all is the “best of both” situation. While this makes some sense from a business perspective (the acquired company’s intellectual property and cultural methodology are part of its value, after all), in practical terms it means dismantling and re-assembling the IT processes of two companies, rather than just the one. Obviously, the more disruptive a merger is likely to be, the more preparation and coordination IT departments will need to have with each other. The merger will also move much more smoothly if both IT departments have a solid understanding of each other’s operating methods, and why different aspects of these systems were constructed a certain way, and how it improves performance. Hitting the Day 100 deadline. Once the merger becomes official, IT teams need to hit the ground running. The longer it takes systems to merge, the greater the disruption, which not only affects productivity, but can also lead to data loss or some other system failure. The 100-day deadline is especially important for M&A, because it marks a full quarter of the two companies being merged. At this point, many businesses may be subject to tax obligations, regulatory oversight, or a full investor report. Without IT systems fully aligned, organizations may not be able to gain a clear picture of their financial state, or could otherwise fail to demonstrate the operational responsibility demanded of them by review boards. Because of this, top level management should have honest conversations with their IT staff about the transition and merger process. IT should provide a realistic timeline for IT integration, and C-suite members should avoid the temptation to add to this list until the most critical deadlines have been achieved. Mergers and acquisitions are an important aspect of modern business growth. However, for them to be successful, they must include IT services Detroit as an integral part of the planning process. Otherwise, businesses could find the hoped for synergies fail to emerge, leaving them in a less stable position than they were before.